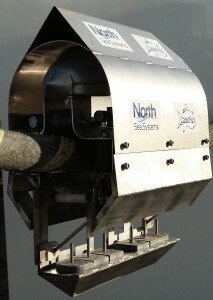 This week North Sea Systems are carrying out trials of their CableFish® survey platform at EMEC. This is the culmination of the MRCF Project, managed by the Carbon Trust and funded by the Scottish Government. CableFish® will offer a survey capability that enables cable laying operations to be extended in tides up to 6 knots in strength – currents in which it is difficult to operate ROVs. 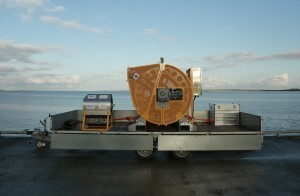 The system consists of a sensor platform that houses cameras, lights, an altimeter, a USBL beacon and a motion sensor. The platform rides down the cable to provide real-time touch-down monitoring and a full record of the installation; this includes visual imaging, positional data and an indication of the cable tension and strumming. A dedicated umbilical management system is used to control the depth of CableFish® and the video and data is integrated into the vessel’s survey spread. The whole system is easily transported by road and mounted on the cable laying vessel. More news of the deployment will be available from North Sea Systems later this month following completion of the trials.